As composite experts we use air tools ourselves as well as train delegates how to use them effectively on our courses. There is always a fine balance between the cost and performance of tools. We have now used Dynabrade air tools for over a decade and none of them have needed replacing (as yet). Founded in 1969, Dynabrade has earned a reputation for excellence in the innovative design and manufacturing of unique portable abrasive power tools and accessories. Over the last few years we have evaluated a wide range of tools, with on-tool extraction and portable dust extraction units, for addressing composite repairs for the future. We found that Dynabrade air tools provide the best off the shelf performance. 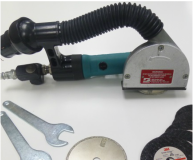 Combining Dynabrade’s continuous research and development with our composite specific expertise, we have developed air tools for processing dust free composite repairs. We are now a recognised ‘Composite Industry Specialist’ for Dynabrade products and have continued to work together to provide air tool kits specifically for use with composite materials. All our composite air tools are supplied as kits that are configured by us, to give the best solution with the most flexibility. Together we ensure that all tools comply to, or even exceed, the requirements of Health & Safety regulations. Defining the best solutions for processing composite materials for production and repair, we can help you achieve perfect results and improve productivity. As standard, all our air tool kits are supplied ready for use; complete with swivel air line connectors and male hi-flow airline connections for best tool performance. 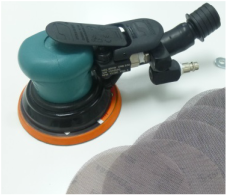 Where air tool kits are supplied with vacuum shrouds these are also supplied with vacuum hose swivel connectors and adaptors (where required) to ensure full compatibility with our range of portable dust extraction units. If you are unsure what tools would best suit your requirements, we can also provide ‘best practice’ advice and training to support our range of products.